Saint’s Simon and Jude were two of Jesus’ Twelve Apostles. St Simon is often referred to as Simon the Zealot, which clearly distinguishes him from Simon Peter. Both are regularly mentioned in the New Testament. St Jude’s father was Clopas and his mother was Mary, cousin of the Blessed Virgin Mary. Clopas was martyred for his outspoken devotion to Jesus. 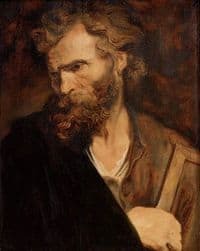 The most commonly accepted tradition is that, after Jesus’ ascension, St’s Simon and Jude travelled and preached the Gospel separately, before jointly evangelising in the Mediterranean and the Middle East. St’s Simon and Jude were martyred around 65AD in Beirut. Their remains were later transferred to St Peter’s Basilica in Rome. Their Feast Day is the 28th October. Pray that we will faithfully live Jesus’ teachings and share it with others.